One of the seven most sacred cities of India, Haridwar is an ancient city which lies in the present state of Uttarakhand. According to Hindu Puranas, Haridwar is one of the holy sites where the immortality elixir, Amrit, was accidentally spilled by Garura, the heavenly bird. This is the reason why the Kumbh Mela is celebrated here every 12 years when millions of Hindu pilgrims come here to attain salvation. The languages spoken in this holy township are =Hindi, Garhwali language, Punjabi language and also English. The word “Haridwar” is derived from two Sanskrit words “Hara” which is another name of Lord Shiva and “Dwara” meaning Gate. In ancient times, this place was also known as Gangadwara, since it’s the entrance point of the holy Ganges River into the Gangetic Plains. Also referred to as Mayapuri and Kapilasthana in the scriptures, this city is one of the four most visited pilgrim spots of the state. According to Hindu legends, King Bhagiratha of the Suryavanshi dynasty brought down the river Ganges from heaven for liberating the souls of his ancestors who were cursed by the Saint Kapila. Between 322-185 BC, Haridwar was ruled by the Maurya dynasty and it became a part of the Kushan Empire from the 1st- 3rd century AD. The city was also invaded by Timur Lang of Central Asia in 1399. Guru Nanak visited this city around 1504 and there is a Gurudwara which commemorates his visit to this township. It is mentioned in Abul Fazal’s Ain-e Akbari that the Mughal Emperor, Akbar, stationed special people at Haridwar who dispatched the holy water from the Ganges in sealed containers which the emperor used to drink on a daily basis. A mint for copper coins was constructed by Akbar at Haridwar. The city still retains the family genealogies of Hindu families for several generations which are recorded by the Hindu priests and handed over from generation to generation. The foundation of the present day city was laid by Man Singh the Raja of Amber. Railways first connected the city with Awadh and Rohilkhand in 1886. Located on the foothills of the Himalayas, one of the oldest cities of the world, Haridwar has a rich cultural heritage. One can still see the beautiful old havelis with their marvelous stonework in the old parts of this city. The sacred ghat of Har ki Pauri in Haridwar was built in the 1st-century BC by Raja Vikramaditya. 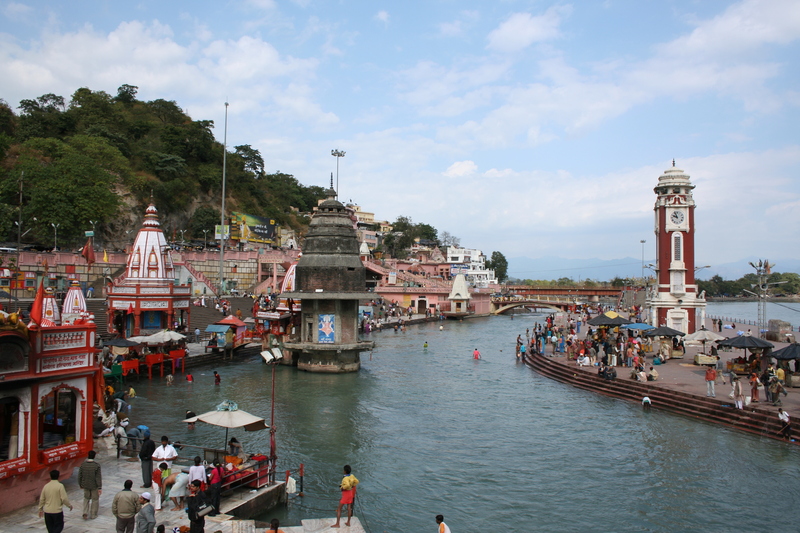 The stone set at Har ki pauri supposedly contains the footprints left by Lord Vishnu. Popular beliefs hold that the king’s brother, Bharthari, used to meditate on the riverside and so the Ghat was constructed by his brother after his death to commemorate him. The Aarti or the evening prayer offered to Ganga, where thousands of spectators from all over the world gather every evening, is a marvelous spectacle for visitors and a uniquely rich experience in sight, sound and color. At the end of the ceremony, people float Diyas (small floats with flowers and candles) in honor of their ancestors. The Chandi Devi Temple, constructed in honor of Goddess Chandi in 1929 by Suchat Singh the king of Kashmir, lies on top of the Neel Parvat (Blue Mountain) that is located on the east of the Ganges. Supposedly, the main statue was placed here in the 8th-century AD by Adi Shankaracharyax. One has to hike 1.9 miles to reach the temple or it can even be reached by ropeway. The Mansa Devi Temple, situated on the top of the Bilwa Hills, is another picturesque temple which allows a terrific view of the city. The Maya Devi temple, built in the 11th-century, is dedicated to Maya Devi, the patron deity of the city and is considered to be one of the sacred sites where the navel and the heart of Sati fell in Puranic times. The Daksha Mahadev temple and the Sati Kund are other ancient temples with mythological heritage which lie in the Kankhal town. Of late, another multi-storey temple, known as Bharat Mata Mandir, was built in 1983 though lacking in history and architectural merits, it attracts a large number of Indian tourists. Being the headquarter of the district of Haridwar, the city is well connected to other important cities of the state. The Haridwar Railway station has trains which link the city with other important cities and pilgrim spots like Varanasi, Puri, Gaya, Delhi, Kolkata, Mumbai and others. Bus and private car services to Haridwar also links this city with Delhi and other big metropolis in northern India. Visitors to Haridwar must visit the holy city of Rishikesh, made famous by The Beatles, which can be reached from Haridwar in 30 minutes by car or local transport. This ancient city is the gateway to the Himalayas and has a number of beautiful temples and many yoga and meditation centers in and around this township. Rishikesh is also well known for its adventure tourism activities like bungee jumping, mountaineering and white water river rafting facilities.